You may have heard of this idea of putting butter into your coffee somewhere at this point and I am by no means on the forefront but I felt like this was just one thing that was definitely worth sharing. The process is fairly simple and takes a little more time in the morning but the results are well worth while. Dave Asprey created this process and has his own line of coffee that is super clean, well roasted and tastes really good. 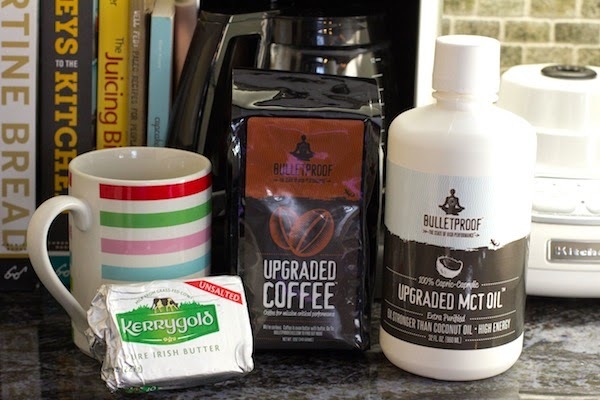 I've done both his "Bulletproof" Coffee and some other independently grown coffee with this recipe and both tasted great. -Add 1-2 tbsp MCT Oil, "Brain Octane Oil", or simply coconut oil. When you blend it together you get a light and frothy (latte-esk) drink. I've always been a straight black nothing added coffee guy and I was hesitant but it tastes fantastic. So what's the benefits of this and is it really good to have all that fat so early? Yes it is, the amount of energy you get from the healthy fats in both the butter and the oil are a great way to feel full and make sure have a sustained energy throughout the morning. I've exchanged the coffee for what I was eating for breakfast and it keeps me full until lunch time and I feel much better. I also add a little salt (or salted butter) to help with adrenal function in the morning so they don't have to stimulate the set up of your body each morning and that added salt helps keep these adrenal glands from having to work to hard and setting you up for being behind all day.